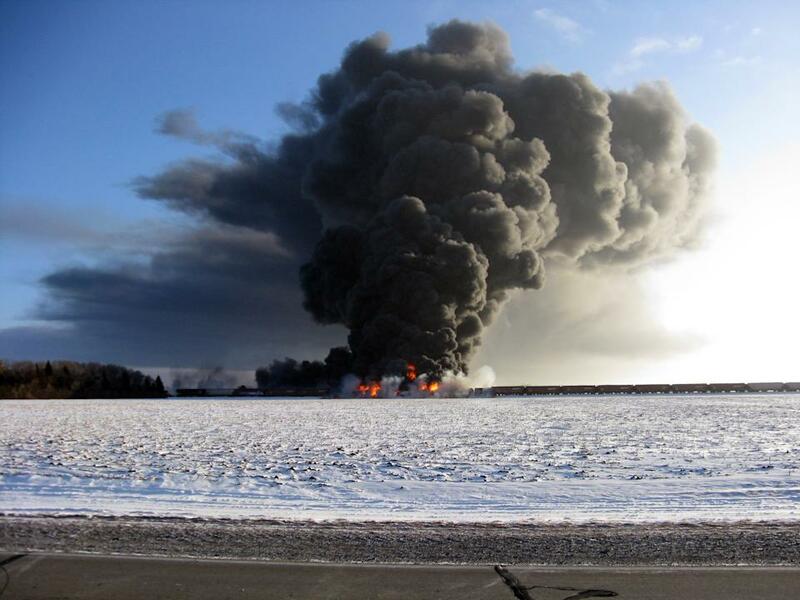 Casselton, a town in North Dakota, had to be evacuated because a train carrying crude oil derailed and exploded. This led to acrid and hazardous smoke blowing into the town and potentially exposing residents to serious health risks. Exposure to burning crude can cause a host of negative side effects including shortness of breath, coughing, and irritated eyes. People with respiratory conditions like asthma, bronchitis or emphysema are at a higher risk of suffering side effects and were advised to minimize outdoor activity. This terrible derailment raises questions about the safety of transporting crude oil by rail across the country. This isn’t the first derailment which resulted in toxic smoke clouds spreading across towns. There was a derailment in Quebec involving a train carrying crude oil. Forty-five lives were lost in that tragic incident. What’s even more disturbing is the continued use of a specific tanker known as the DOT-111. This type of rail car suffers from a design flaw which causes its steel shell to puncture easily in the event of a derailment. This design defect contributed to the Quebec derailment. Our firm published an article on the Legal Examiner discussing this terrible design flaw. Check it out here. Despite the risks associated with transporting crude oil by rail, and the design flaw apparent in the DOT-111, the number of crude oil carloads hauled by U.S. railroads increased dramatically from 10,840 in 2009 to a projected 400,000 this year, according to Yahoo News. Furthermore, North Dakota plans only to increase the amount of oil transported by rail. In fact, a North Dakota oil regulator stated that as much as 90 percent of North Dakota's oil will be transported by rail in 2014, which is a major spoke from the current 60 percent. So what is the takeaway from all of this? First and foremost, it’s apparent that rail transportation of crude oil is not going to be stopped in the immediate future and will actually be relied upon even more by states. Second, there are inadequate safety mechanisms in place to control the spread of toxic fumes after a derailment. Railroad companies should strongly consider doing some research and development on ways to reduce the spread of smoke if a derailment of this nature occurs in the future. Derailments of trains carrying chemicals can have devastating consequences. For example, a derailment in Graniteville, South Carolina resulted in the largest chlorine spill in U.S. history and residents of Graniteville are still trying to fully recover from that terrible incident. Given the horrific ramificiations that can come from a derailment, it is incumbent upon the railroad industry to put in place effective safety mechanisms on their trains to try and reduce the damage that can occur. It may cost money up front to implement new safety mechanisms, but the money saved down the road from avoiding a derailment that causes catastrophic damage to an entire city or town is well worth the investment.